My ship has been swallowed up by the darker-than-black ocean. It should have been a simple trade run, ferrying lost souls and spider-silk across the underground sea, back to Fallen London, a Victorian metropolis dragged beneath the earth by bats. But I’ve overextended, travelling too far in search of goods, and now I’m out of fuel and supplies. As is so often the case in Sunless Sea, my crew is now mad, throwing themselves overboard, shrieking and fighting, brains unable to parse the existence of stars underground or the monstrous sea beasts they’ve seen. Either at the hands of mutineers or mad men, I’m going to die, and it’s going to be permanent. That almost, but not quite, inevitable climax, death, looms over every nautical journey in Failbetter Games’ top-down seafaring sandbox. With every text-adventure-style quest embarked upon, there’s always the question: is this the one that will send me over the edge? The answer is, of course, eat their flesh and sacrifice the rest. 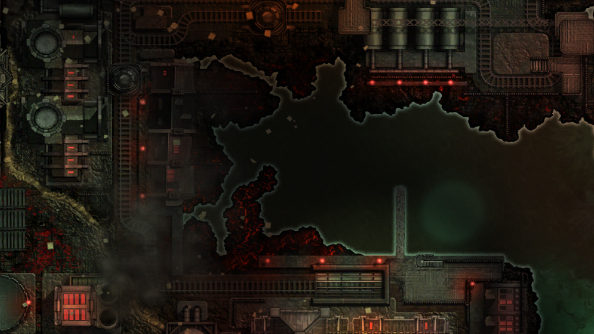 The cavernous ocean of Sunless Sea, the unterzee, is a cruel, expansive nightmare populated by the mad and damned, the secretive and mercurial, and countless subterranean monstrosities and fickle gods. It’s a world that’s been fleshed out over several years in the brilliant, predominantly text-based browser game, Fallen London. 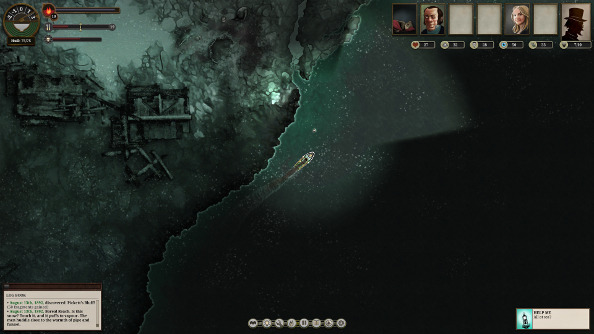 But Sunless Sea gives it new, animated, life and unsettling stories. It is a game crafted by those with an irrepressible love, and possibly hunger, for words and tales. The lavishly written adventure has enough text to fill two books, full of strange colloquialisms and odd people (as well as quite a few odd not-people). In the beginning, the story appears to be about a new captain, looking to get rich, write an epic piece of literature or discover their father’s bones, but the vast unterzee quickly gets in the way with a multitude of threads unravelling into bizarre quests. Docking at a port opens up “the Gazette”, a log of quests, ship and storage information, and character histories. It also displays a list of potential activities and plot points with little painted icons. 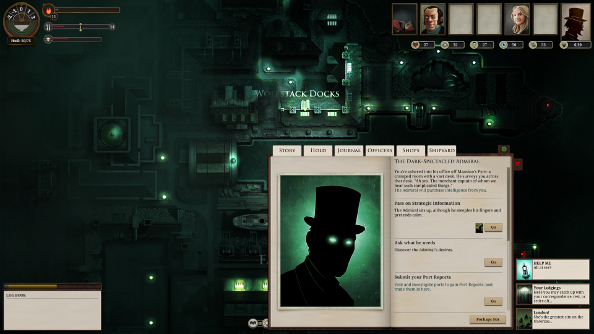 While Sunless Sea is more animated and involved that its progenitor, Fallen London, it still has the trappings of a text adventure. These portside activities range from incidental things, like a game of riddles or an evening carousing the docks, to much larger quest lines with objectives laid out across the sea. Embarking on any activity has consequences. Some of them are good, like a skill increase, the little RPG numbers rising, but captains rarely get anywhere without first giving something up. Sacrifice is the name of the game. Almost everything has a cost, whether it’s mundane currency or the ominous acquisition of terror. Bound away in the Dreadnought, to the west’ard we’ll steer. Simply being out at sea, or zee, causes terror. The darkness, the strange beasts, they plant a seed in the hearts of sailors, and that seed grows into a tree of fear with roots that spread out across the entire ship. And the more afraid the crew is, the more round the bend they go. A vessel can be torn apart by a mad crew, and when one goes off the deep end, it infects the others. Terror is the one currency in Sunless Sea that’s in abundance but unwanted. And it persists, even after its been cured, in the form of nightmares that can only be laid to rest over time through relaxing evenings spent away from the ocean, safe in an inn or at home. There’s respite to be found, but it’s easy to overextend and end up far from home, sinking into insanity, or just the water. While the zee is undoubtedly a foe, most of the time, it’s also the source of many treasures; some stolen from defeated foes in real-time combat, where lighting up enemies in the darkness and smart positioning is key to victory, and some found on the many islands peppering it. Mapping it, filling in the black with coastlines and landmarks, is a singular delight. There are many mysteries in Sunless Sea, but the one at the forefront is the mystery of what lies out there, in the mare incognitum. In the middle of nowhere, north of Where The Hell Are We, implausible things can appear out of the fog. Great frozen cities, ancient, formidable leviathans and foreign fortresses come into view, promising more oddities and the occasional fight, or bizarre denizens and curiosities to trade for. They are like lighthouses, beckoning captains to dock and explore. Whisky? How about some fungal spirits instead? Maybe with a bowl of bat wings? There’s little of the ordinary in the unterzee, and anything that does at first seem normal soon reveals itself to be a wee bit warped. Sunless Sea’s strangeness, the way that it uncomfortably plays with words and expectations, informs even the well-trodden aspects of the game. Trade is a simple affair, for instance, with different ports having different prices and goods, so the trick is to simply buy cheap and sell high, but it’s twisted by the fiction. Souls can be sold to unscrupulous sorts, romantic literature can be shifted on the blackmarket, and an uneventful trip with cargo and passengers can end in a drunken sword fight with a mummy (they like to be called Tomb Colonists). With everything being so strange and alien, the unexpected is never far away. This makes the abundant decisions that rise up in every port or in the middle of a voyage extremely risky. Underneath the text are convenient icons and explanations that note the cost of an action and some of its potential results, but they are purposefully vague. The effects of a decision can appear when least expected, surprising with a spot of good fortune, or some rather terrible news. Amid all the chaos and dangers, however, is optimism. 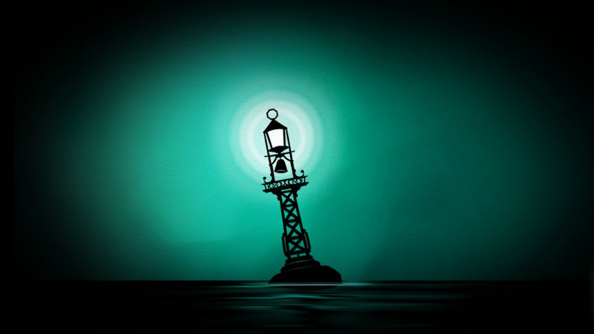 Sunless Sea taps into that romantic notion that a life at sea is liberating, where any man or woman can make something of themselves, something better. Captain’s backgrounds, chosen at the start of the game, inform different skills and confer a free, unique, officer – special sailors with their own stories and bonuses – for the ship, but they are all explorers and all in some way trying to better themselves. That adventurous spirit and derring-do is something to hold on to when the zee gets choppy. Aye, aye, roll and go! Back on land, between the moments when the zee is calling, relationships can blossom. They can be cruelly snuffed out too because, like living, happiness is not guaranteed in the unterzee. But if a captain’s special lass or handsome fella sticks around, then the relationship can bear fruit in the form of an heir, a chance at a sliver of immortality. Death is inevitable. And it’s likely close by. Mismanaged supplies can leave a crew starving, sparking a mutiny. An engine pushed too hard can explode, burning the ship and everyone in it to ash. Everyone could just go mad. Most captains will die, horribly, without achieving anything great, but they leave behind a legacy, giving others, like their child, the chance to succeed where they failed. 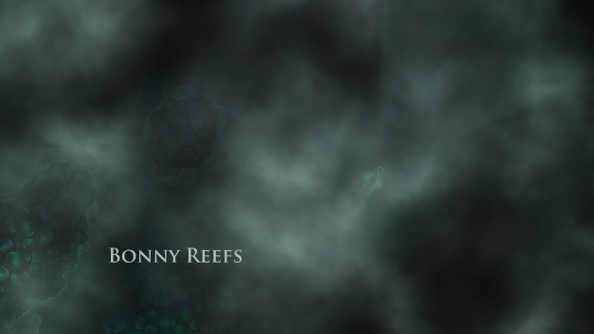 Again, Sunless Sea plays with the romanticism of a living made on the deck of a ship. A child stuck at home, its mother or father always out at sea, briefly coming home with incredible stories of impossible places; a teenager running away to follow in its distant parent’s wake, making its own mark on the world. An heir that’s run off to sea takes the place of their dead parent, maybe getting their old map, some of their secrets, and if there’s an ironclad will involved, an estate. Death isn’t pleasant, but it’s not the end. Even without an heir, a captain can pass something on to their successor, whether they are a rival or an old friend, perhaps with new goals. All that can be flung aside in favour of a completely fresh start, however, with a new, randomised map. So we’ve come full circle. With every life that ends beneath the stone sky, another one steps in to take its place. But there’s always a sense of progress. A better knowledge of the islands jutting out of the darkness, more skill in fighting, a shrewder mind – all these things can be passed on. And scenarios that pop up again can be tackled differently. What shall we do with a drunken sailor? Well, maybe this time we’ll just let him enjoy himself. Maybe the whole crew deserves some shore leave. 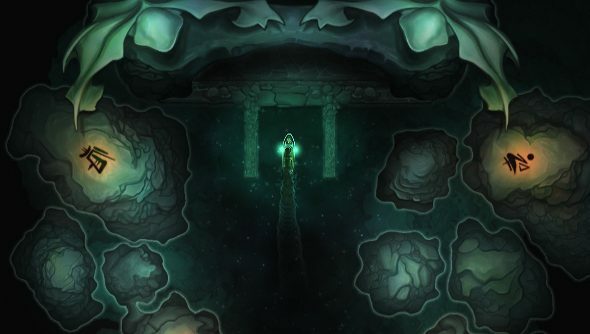 Failbetter has concocted a game that sticks around, even after it’s been exited. Not just with questions needing answers that are still being hunted for, but in the way the beautiful writing and haunting music lingers. As fantastical and confusing as it might be, it’s been constructed so expertly that it’s utterly convincing. Sunless Sea does demand a lot from its captains, though. Patience, mainly. It’s a slow, deliberate game, where a journey across the map can take an age, and where secrets are unfurled without haste. But the sea offers up a veritable bounty of rewards, and absolutely the best writing in any video game since, well, as long as I can remember. 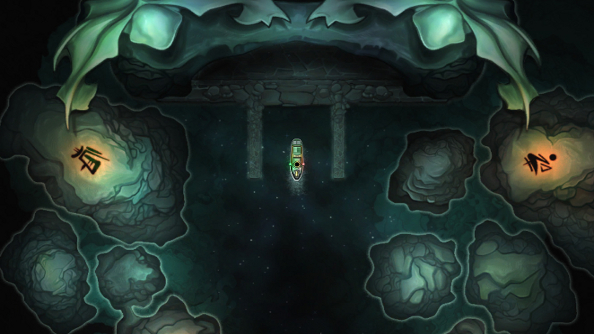 Sunless Seais a nautical sandbox. A beautifully illustrated map of an underground ocean is yours to explore from a birds-eye perspective. A little steamboat is your avatar, carrying cargo and sailors to destinations where Choose Your Own Adventure stories flesh out the bizarre subterranean world. It’s Sid Meier’s Pirates by way of Lovecraft, where exploration yields secrets and new ports. There are stories to keep you on track and characters offering quests that send you to distant islands, but how you make your way in the world as a fresh-faced captain is up to you. Trade in fine silks or information, fight the horrors of the deep in real-time combat, become a supplicant of an elder god – the game is ambiguous and vague, letting you chart your own course through the murky waters. And it’s all done through that striking map and a journal that contains all of the game’s text-heavy menus and dialogue. This mariner’s tale begins, not out at sea where giant crabs prowl and unseen horrors lurk, but where all nautical adventures start: on land, specifically in the gloomy city of Fallen London. It’s Sunless Sea’s hub, and also its origin. A surreal, gothic metropolis pulled down to the world within a world by bats – yes, bats – Fallen London is the setting and name of Failbetter Games’ browser-based text adventure. It’s also now the setting of the developer’s first PC game. 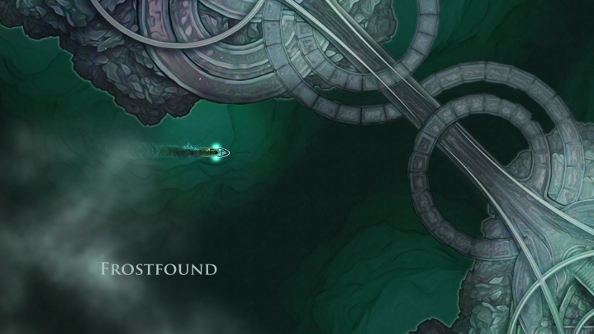 They share setting and themes, but Sunless Sea throws trading, exploration and combat into the mix, expanding it well beyond the text adventures of its browser cousin and beyond the streets of the sprawling city. It’s an entirely different kettle of fish. It got its hooks into me – or, given the nautical theme, perhaps that should be pincers – for the same reasons as its predecessor though: the clever, and often gruesome, writing and the impossible world it takes place in. I’m a scholar of the natural world with an adventurous bent and a jaunty top hat. I’m also the captain of a charming steamboat with a crew of ne’er-do-wells and an unfriendly ferret for a mascot. Fame and fortune await me out in the horrible blackness of the underground sea, but all that plays second fiddle to the real reason for this adventure: knowledge. There’s certainly money changing hands in Fallen London and the various ports dotted around the ocean, but the most important currency in Sunless Sea is knowledge, in the form of secrets, stories, maps and information that leads to favours. My brain is filled with mundane scraps. I know where to get good deals on certain goods and the fears and hopes of dockmasters and sailors, but there is priceless knowledge too. I sell the admiralty espionage reports, I drink tea with mysterious oracles and I bring home stories of leviathans and terrifying sunlight in places where there is no sun. It’s stories that drive Sunless Sea. There’s a lot of text. Failbetter says that there’s around 100,000 words in the game right now, and by launch they’re expecting that to grow to 250,000 – two novels worth. So there’s a lot of reading to do, and no spoken dialogue. The text adventure roots are as clear as the lights of Fallen London, burning away the fog and darkness. And every phrase, every word, they all have purpose, each of them building the fantastical world. There are words that need to be learned and phrases that at first make little sense. The sea is the zee, the giant cavern is called Neath and there are factions, colloquialisms and history that are drip fed throughout the nautical romp. And the only way to become familiar with Neath is by exploring it. While there are missions and narrative arcs that push you out to sea… zee, Sunless Sea is a watery sandbox, and exploration is its own reward. Captains begin with one small ship, an equally small crew and a measly amount of echoes, the most straightforward currency of Neath – essentially cash. 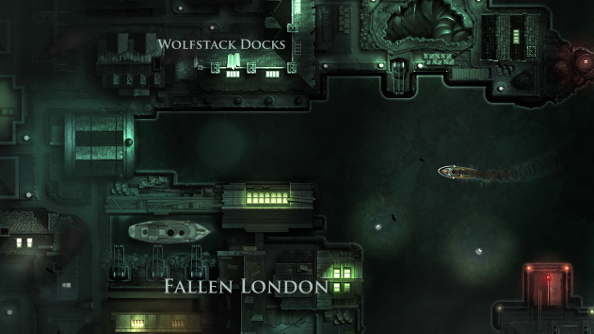 It’s a simple matter to leave the docks of Fallen London and sail out into the abyss, controlling the ship in real time. There’s a lot of sailing back and forth, usually quite slowly, but even though it threatens to become a little repetitive, Failbetter’s ensured that there’s always something unexpected just over the next wave. It might be a fight. Pirates and sea monsters prowl the zee, hungry for loot or the taste of human flesh. Combat looks turn-based, at a glance, but it isn’t really. Actions are queued up and have cool downs, so it sits somewhere in between action-based battles and turn-based scraps. All violent conflict is built around the simple but clever premise of illumination. It’s dark in the Neath, so targets need to be lit up before they can be attacked. Moving closer to an enemy will make it easier to spot, but also invites boarding parties and melee attacks, while shooting flares into the sky illuminates the enemy, but also your own ship. Fights do have a tendency to play out in the same way each time, with each pirate vessel using the same tactics and each giant crab acting like the last large crustacean you fought. They don’t tend to take long, becoming shorter as bigger ships and more powerful weapons are bought, though I’d give my right eye for an auto-resolve option when fighting things like bats, where the chance of failure is next to nil. Far more interesting are the less tangible threats that appear out at zee. Three resources must be managed on the ship: fuel, supplies and terror. The first two are self-explanatory – ships need fuel to keep moving and supplies to feed the crew. The terror resource, though, that’s a little bit special. It’s not worlds apart from Amnesia’s insanity meter. The more bizarre, alien things that the crew witnesses, both on the islands dotted around Neath and on the zee itself, the more terror they have. High terror manifests itself in various ways. During one long voyage, where we’d dropped off a bunch of coffins filled with the not-quite-dead for a tidy profit, the crew and I decided to continue north instead of going back home. The light of settlements and buoys faded, and in the darkness we grew afraid. As the crew started acting strangely, I turned the ship around, but it was too late. One of the sailors covered himself in pots and pans from the kitchen and threw himself into the water. He sunk, and we couldn’t find him. And then there were the nightmares, horrible Lovecraftian things that have no place in the sleeping mind. There are ways to reduce terror, from carousing in ports, relaxing at home or hearing pleasant stories, but if the terror of you and your crew was already very high, then it will do lasting damage. The nightmares are now my constant companion because I didn’t know when to turn around and go back to London. Sunless Sea is naturally tense. Random misfortune can doom a vessel, and there’s horror and madness lurking everywhere. This is only increased by the option to play it like a roguelike. Right now, it can be played with permadeath, but the static world means that it misses some of the random elements of the subgenre. This will change. In a future update, the zee will shift, making each game different. Without this, there’s still plenty of space for unique experiences though. Making different choices like the officers you hire – who come with their own skills, stories and secrets – or the goals you are working towards echo throughout the game, changing the story of your vessel and her crew considerably. 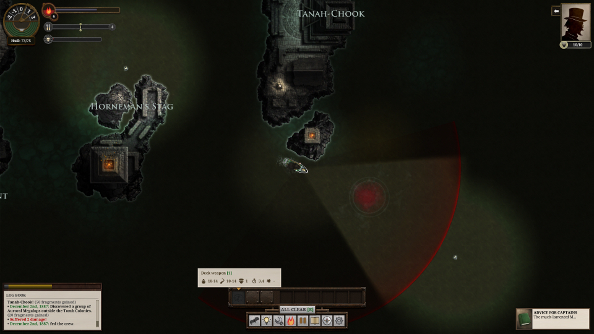 Sunless Sea is not in alpha. It’s in late beta, so it’s already in a fairly polished state with a significant amount of content. Jumping in now comes with the promise of countless high-zee adventures and the chance to push back the darkness, exploring a world that feels truly alien, brought to life by exceptional writing evocative of Lovecraft, Shelly and even Pratchett and gorgeous art and illustrations. Fallen London is free, so play that, and if you like what you read, you really should buy its Early Access cousin.